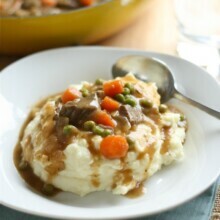 Never worry about how to make beef stew again with this Irish Beef Stew and Mashed Potatoes recipe! Super tasty and perfect for dinner. When you are ready to serve, remove bay leaf. In a small bowl stir softened butter and flour together until smooth and incorporated. Stir butter mixture into the stew with the frozen peas. Once the gravy thickens slightly, it's done. Serve hot over mashed potatoes.